Description: A high-performance gel cleanser that helps bring out your lightest, brightest complexion. 120ml / 4.23 fl oz. Description: Harnessing the positive energy of sweet sage, our toner offers immediate moisture and hydration to dry and stressed skin. This essential daily spritzer provides balance and resurrection to the skin’s surface – as well as your emotions. A gorgeous, effective step to your cleansing ritual, it helps minimize the appearance of open pores. 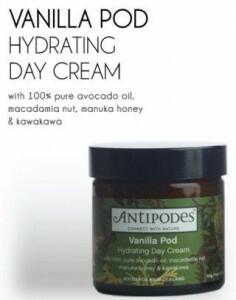 This is the perfect preparation for applying Antipodes moisturizers and Divine Face Oil. 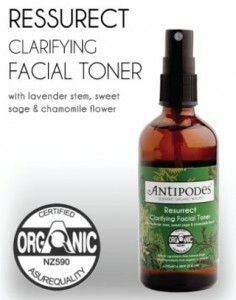 Description: High in natural minerals & voted “Worlds Best Water”*, offers hydration & moisture balance to sensitized skins. Raspberry extract which is high in omegas, helps strengthen stressed & delicate skin, while soothing skin irritated by environmental aggressors, Antioxidant-rich Mamaku black fern assists with healthy cell proliferation. Daily Ritual: Apply at sunrise, high noon and sunset by misting across face and neck. 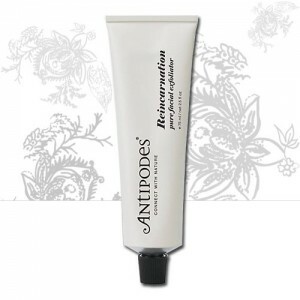 Description: A beautifully effective yet gentle facial exfoliator. 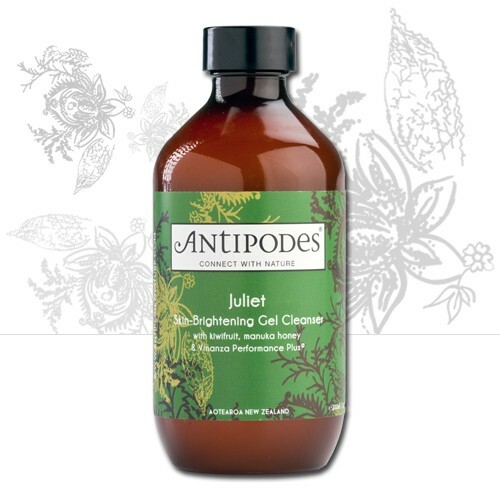 Avocado oil and jojoba beads marry to lift away lifeless skin, while calendula oil works to nurture and repair. Daily Ritual: Gently blend into moist skin at sunrise or whenever our skin calls for a new life. Rinse well with warm and pure water. Description: A traditional remedy of New Zealand Maori people is manuka honey, which powerfully draws moisture to your skin to hydrate it intensely. The facial mask delivers a deeply moisturizing, cleansing and anti-oxidizing treatment. Fragrances of vanilla pod and mandarin linger to bring peace and balance to your aura – meaning you’re tending both your skin and your spirit. 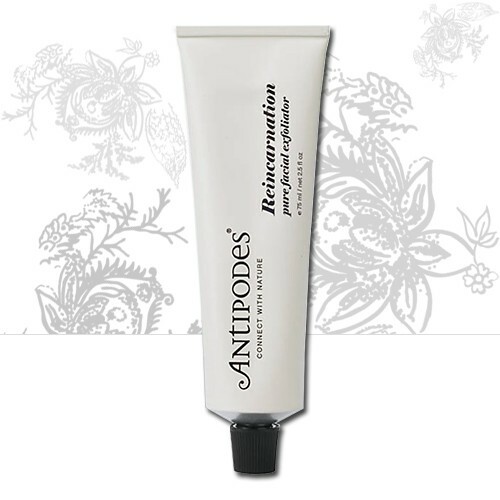 Daily Ritual: Smooth thick layers of this creamy mask over your face and neck twice weekly. Leave for 15 minutes and rinse with warm and pure water. Also ideal for treating spots and blemished as they may arise. Description: Plump up your skin contour with this water-charged oil free, bioactive serum that immediately quenches thirsty skin and helps intensively improve skin appearance over time. Daily Ritual: Plump up your skin contour at sunrise and twilight by massaging into your face in a circular motion. Relax and let it soothe. 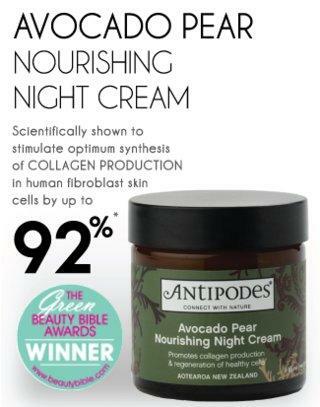 Suited to normal and oily skin conditions. Here is a water-based corrective serum to help target pigmentation, brighten your skin and restore even tone. It is destined to have a leading role in your daily beauty ritual with its revolutionary bioactive ingredients from New Zealand nature. Waiwera mineral water from an ancient spring voted the world’s best water* restores essential moisture to parched skin. Antioxidant-rich Vinanza Performance Plus addresses facial redness and the melanin production that can cause discoloration. Add in the subtle exfoliating action of superfruit kiwi enzyme and soothing Oxifend from red grapes, and your skin will be gloriously glowing! 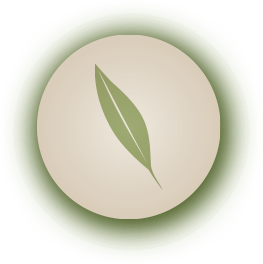 Mamaku black fern and Reishi mushroom assist with healthy cell renewal for the ultimate fresh-faced beauty. Description: A silky night serum that helps rescue dry, damaged skin. Himalayan goji berry boasts up to 19 amino acids to help optimise your skin’s appearance. Red raspberry seed oil blends with New Zealand blackcurrant, a rich source of essential fats like gamma-linolenic acid (GLA). South Pacific hibiscus flower freshens your complexion, whileberry fragrance imparts pure joy. Suited to normal and ultra-dry skin conditions. radical damage with this water-based serum accenting the antioxidant potency of New Zealand-grown superfruit. In superfruit complex Vinanza Oxifend Plus®, boysenberry, blackcurrant, kiwifruit and revolutionary antioxidant Vinanza Grape® from grape seeds are extracted with a technique using only pure water for high natural bioactivity and no chemical residue. With shots of coffee berry, açaí and the essential fatty acid alpha lipoic acid (ALA), this is a supreme daily organic skin booster. Description: This facial night cream also features calendula oil from marigold petals highly regarded throughout history for its healing and repairing properties. Active manuka honey soothes and moistens your skin. 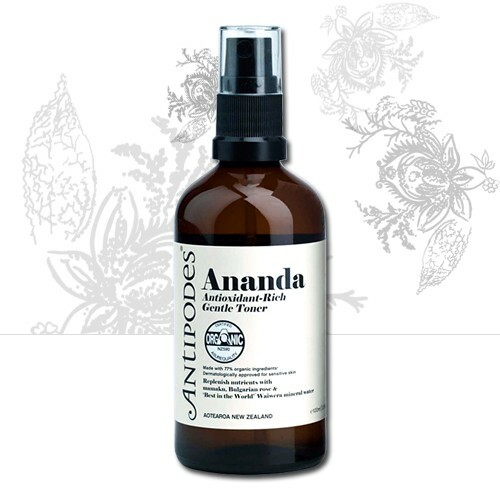 Potent antioxidant Vinanza Grape helps neutralize free radical damage. Daily Ritual: Apply at sunset by caressing onto your face, neck and cleavage. 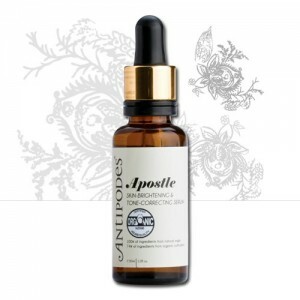 For a super-restorative effect, use Divine Face Oil first. Description: Revolutionary Vinanza Grape, a potent antioxidant extract from Malborough sauvignon blanc grapeseeds, keeps your skin healthy and energized. 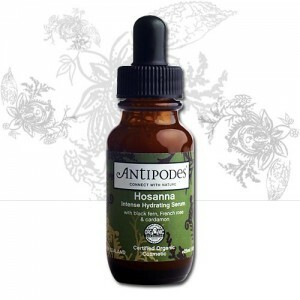 Native New Zealand manuka honey has powerful antibacterial properties to keep skin clear and fresh. Daily Ritual: Apply at sunrise by gently massaging across face, neck and cleavage. 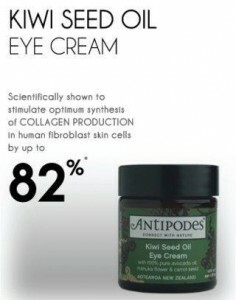 Description: Ultra-rich Vitamin C from the seed of the New Zealand kiwi fruit works superbly to help repair damaged tissue around the delicate eye area. Containing carrot seed oil, aloe gel and 100% pure avocado oil, this is a fragrance-free product your skin will love. Daily Ritual: Apply to the delicate area around the eyes at sunrise and sunset, and any time between.